While gutters are a protective measure, they are also prone to damage. Irrespective of the type of gutters you choose for your home in terms of material, elements of weather are stronger. On prolonged use, the gutters are bound to succumb and leak. Of course, you should clean your gutter regularly and implement other maintenance techniques. While these guarantee you prolonged service, gutters are bound to get damaged and you will need to repair. In extreme cases, you will need to replace. 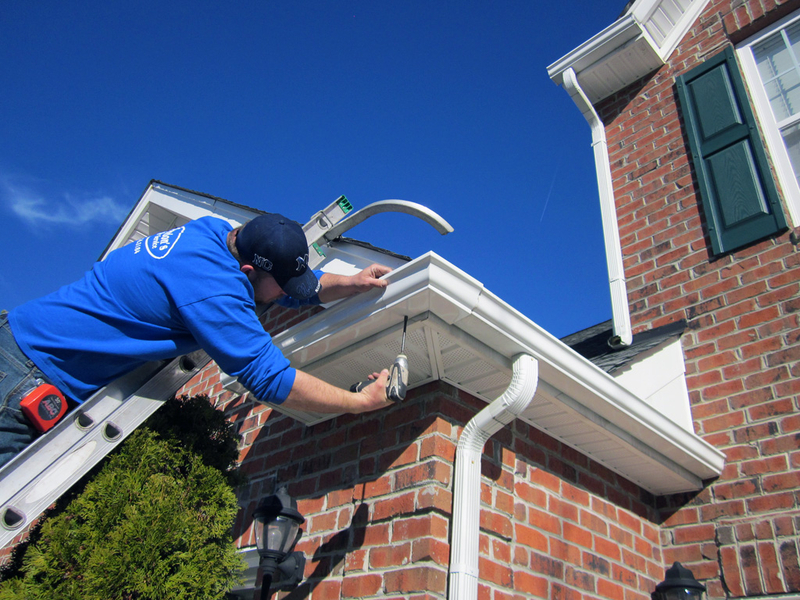 Gutter repair is increasing in demand because of the frequency of damage. If you are living in a region susceptible to extreme weather, you should always be ready to pay for maintenance and other kinds of repair. Part of maintenance practices should be repaired; you have to adjust the strings holding the gutters and cover any loose bases that can result in holes. If you installed gutters several months ago, you know why you need to call a professional for repair after storms. Gutters are prone to damage from multiple angles. Damage can be as a result of negligence or natural factors; either way, you should familiarize with the possible damages to implement any available preventive measures. This is the most common type of gutter. It involves the accumulation of debris or leaves in the gutter that prevents water from flowing to the designated place. Clogging is common in Fall or Winter when leaves fall every day. It can be tedious to clean the gutters because, by the time you finish, other leaves will be on the other side of the roof. While you should schedule a time to remove the leaves to avoid more damage to your house, you should strive to do it as regularly as possible. Prolonged existence of water in a particular spot can cause cracks that develop to holes. Any amount of water staying in one position for a long time can weaken the gutter irrespective of the material hence emergence of the holes. It is often a small hole that can easily be ignored but can be causing harm to your wall or foundation. Seeping should not be ignored, no matter how small the drain is because prolonged seeping will weaken the wall or soil. Extreme weather conditions and clogging cause increase in weight hence sagging of gutters. When gutters are clogged, water accumulates hence increasing the weight. The gutter might be tough but it is not meant to handle such kind of weight for a long period. Obviously, you will notice a shift in the design of your gutters. Sagging on one side can redirect water to a particular point hence soil erosion. Besides, it can end up falling thus causing damage to property. Gutters in windy areas can easily be blown away. While the installation might have been perfect, continuous exposure to strong winds weaken the adhesive force and any form of attachment on the fascia boards. It is important to seek professional services to help in placing the troughs in an appropriate position. Wind distortions can be extreme and you may never find your equipment; however, if you are lucky to find them and they are in good shape, consider a repair. Otherwise, falling trough damages from wind usually end up in replacement and new installations. The wind blows all kind of leaves to your gutters. Debris and other kinds of pollutants can also fill gutters on continuous precipitation. Extra weight on gutters causes them to sag on one side hence causing leakage. Sagging gutters cannot function effectively and you have to seek experts to clean and fix them back on track. Whenever debris accumulates in gutters, you risk damaging not only the gutter but also soil and environment around. Also, you risk damage to property near the gutter. Why you should hire professionals from Smart Gutter Solutions for gutter repair! Repairing gutters can be dangerous if you are not sure how to handle the material and specific type of gutters. Also, it can be tedious to fix a damaged gutter. In most cases, repair requires specific tools, which you might not have in your garage. Besides, the fact that gutters are exposed to elements, they need specific skills to fix for guaranteed function. In most cases, gutter repair involves changing the whole structure. The installation process might be different because some of the tool used to fix the gutters previously might be off. Fixing it on your own can compromise on its function. You need an expert with experience in repairs to at least guide on fixing the new gutters for long-term service. The metal or steel at the edge of your roof might seem like a traditional fix. It is easy to assume you will climb up and tie it on the fascia board. However, most of the facial designs are complicated and you might not be familiar with the tools used to fix each of them. Typically, fixing gutters is difficult; you need a certain level of expertise that you cannot learn overnight. You need professionals in gutter repairs. Professional companies dealing with gutter repairs like Smart Gutter Solutions offer you guarantee of services. In the event you experience problems with your gutters before a certain period or under certain conditions, you are eligible for compensation.